Dog bites are a serious problem. In the first chapter of this book, you will read some rather alarming statistics about the frequency of dog bites and the cost associated with dog bite injuries and damages. Whether it’s a nip, a scratch or a bite, a dog attack can cause serious physical and mental injury to a victim. Although anyone can be bitten, the number of recorded dog bite injuries is significantly higher in children than adults. The elderly and home service providers such as mail carriers and meter readers are also high on the list of frequent dog bite victims. We wrote this book to help dog bite victims and families of victims in Ohio get a basic understanding of what they can do and what they shouldn’t do after suffering a dog attack in order to protect themselves and their future as well as the safety of their communities. We didn’t write this book because we dislike dogs. Quite the contrary, we believe dogs can be wonderful and loyal companions that enrich peoples’ lives. But the fact remains, some dog owners don’t control and supervise their dogs properly and some dogs do attack, causing serious injury and damage. When this happens, lives changes and a victim needs to adjust and prepare for that change. The laws of the state of Ohio understand the seriousness of a dog attack and allow a victim to take decisive action when a dog bite has occurred in order for that victim to recover fair compensation for their injuries and damages. As described within this book, a homeowner’s insurance policy issued to the owner of a dog that attacked someone is usually the source for providing compensation legally due a dog bite victim. A team of professionals will be employed by the insurance company to protect the insurance company’s interests in either denying a dog bite claim or paying as little as possible for a claim. The dog owner’s insurance company has experienced and knowledgeable professionals working for them. If you or a family member has become the victim of a dog bite, you should have professionals working to protect you too. This book is intended to give you a basic understanding of Ohio dog bite laws and actions you can take as a dog bite victim. It’s also intended to calm any fears you may have about contacting an Ohio dog bite attorney to get help with your case. Reputable dog bite lawyers will gladly speak to you about your dog bite claim and provide you very useful feedback on what you can do. Good attorneys will speak to you about your case in a friendly manner and at no cost to you whatsoever. It’s what is known as a Free Consultation. These consultations can answer your questions, quiet anxieties, take away uncertainties about the future and relieve fears of the unknown. There is no reason not to reach out to an attorney when a traumatic event like a dog attacks occurs so you understand your options. 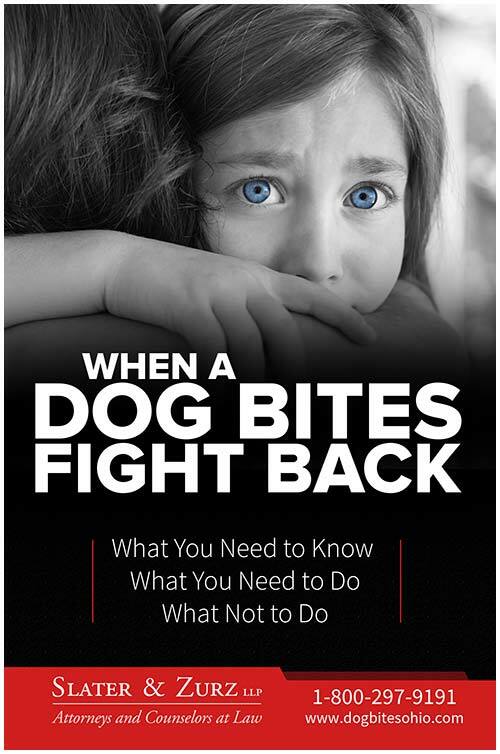 If you or a loved one has become the victim of a dog attack anywhere in Ohio, we encourage you to read this book, arm yourself with knowledge and seek the help of an experienced dog bite lawyer to fight back and take control of your life.